I did this all wrong. I’m travelling in reverse down the Stephen King highway. I started with Joyland, then On Writing, then 11/22/63, and then Under the Dome, and I’m just now reading his older works. And there’s a noticeable difference. Other King fans have had the benefit of growing up, watching King define his writing prowess. From where I stand, I have an opportunity to peer through the looking glass and compare the King of yesteryear to the author he is today. And that’s a good thing. That’s what fuels my desire and whets my appetite more. 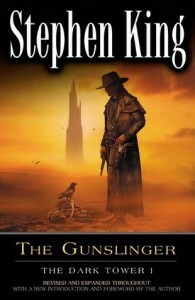 The Gunslinger is an example of a creative genius trying too hard. As his preamble states, King tried to combine The Lord of the Rings with a Sergio Leone western. And you know what? For the most part he pulled it off. Here, in just the beginning of a seven novel journey, I can see the making of a brilliantly crafted universe packed with love, sacrifice, heroism, action, and every other clichéd word that’s come out of a deep-voiced trailer narrative. What falls apart—again, in King’s own admittance—is a writing that obfuscates the view. With the defunct blowhard narrative, the obsessively used adverbs, and the broken apart flashbacks, the reader is left with a blurred masterpiece. What could have been, and what King promises later is true, is a vivid, amazing story. I’m just disappointed I need to wait until a later book for this to transpire. The youthfulness of King’s writing often makes its appearance throughout the Gunslinger. We’re witness to whatever writing workshop advice King received. I’m sure someone told him all the great writers have a story within a story. I’m also assuming due to the frequency of its use, he newly learned the word palaver. The time spent in King’s alternate universe was not a waste. I appreciated the journey. There was enough action to move me forward and enough foreshadowing to yearn for more. Again, I just wish the flashbacks were more defined and the narrative more clear.